Imagine a world on the brink of war. A child taken by shadows in the night. A young man forced by circumstance to run, jump, and fight his way through a danger-filled world to save his younger sister. And the little, stuffed bunny who shows him the way. Albert & Otto has all of these. 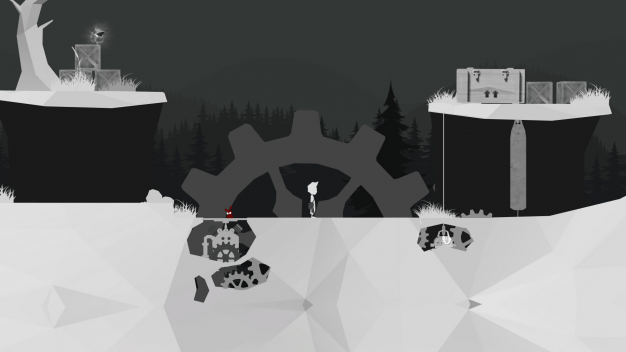 This puzzle-platformer from indie game developer Kbros tells the story of Albert, a young gun-toting boy on a journey to save his sister. Along the way, Albert is aided by his sister’s stuffed bunny, Otto, the only trace he has of her. All of this takes place against the backdrop of pre-World War II Germany, an aspect that slowly works its way into the setting of the game. 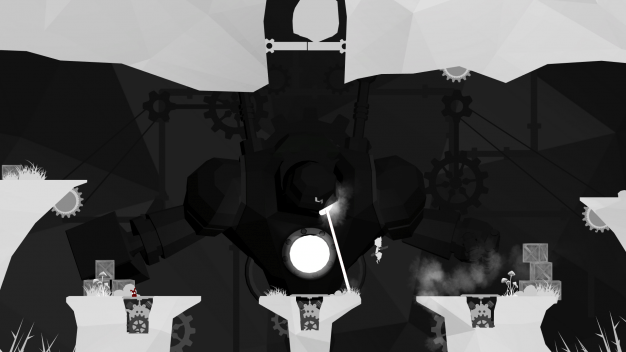 Inspired by early Tim Burton films, the course and background in Albert & Otto are created entirely in grey scale; it’s a feature that, combined with ambient music and mysterious gears that seem to be an integral feature of this world, carries on the sinister tone created at the opening of the game when your sister is abducted by formless black shadows. The only exception to this color scheme is Otto, who is a deep crimson. Symbolic, perhaps? Could it be so that you don’t lose him after setting him down? This is a very mysterious game. Armed with a stuffed bunny and a gun for shooting crows, Albert must make his way through this monotone world to find his missing sister. Along the way, Albert faces puzzles that put the player’s wits to the test. Albert & Otto doesn’t ease the player into the puzzles either – I was stumped on the very first one for longer than I’m willing to admit. Otto, being the mysterious and magical bunny that he is, does his part to help by offering his unique services. Beyond holding down switches, Otto grants Albert the power of telekinesis, which allows Albert to use rocks and crates to help him reach obstacles or activate mechanisms, as well as the power to operate electrical switches from a distance. The controls in Albert & Otto made getting started rather difficult. The in-game directions are tailored toward playing with a controller, so there are no directions for how to play with a keyboard. When I couldn’t figure out how to get my gun to shoot, I finally connected my controller and found out that on top of knowing what buttons to push now, the controls were much more responsive when playing with a controller. For example, a jump over missing planks on a bridge was very difficult (and frustrating) when playing using the keyboard but didn’t even give me pause once I switched to my controller. When I did that, I didn’t have another problem. 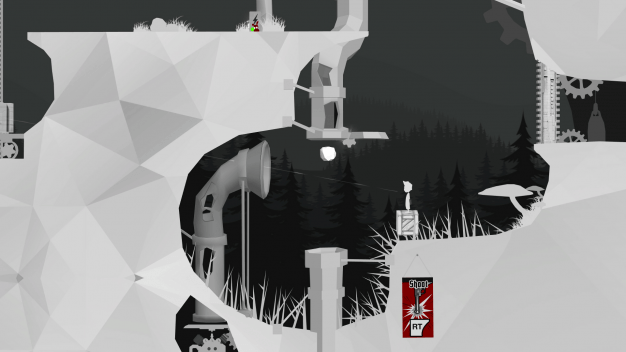 Albert & Otto is for anyone who loves a platformer with some challenge. The design, gameplay and puzzles make the game fun to play, and the mysterious plot drives you forward with unanswered questions and an urge to see what’s waiting for you ahead. If you’re curious about checking this game out but you don’t have a controller, this may be a good time to invest in one, because once you do, you’ll be able to bypass any difficulty with controls and be able to enjoy the game uninhibited. The first of four episodes of Albert & Otto is set to be released on Steam October 28th.